When 53-year-old JoAnn Forster of Eau Claire, Wis., had a heart attack, she was at first only aware of not feeling well. "I started perspiring and couldn't breathe," says JoAnn of her symptoms. By nightfall she was hospitalized and her doctors soon determined that JoAnn needed an additional level of care. They had her transferred to Mayo Clinic in Rochester, Minn.
Over the next few weeks, three more cardiac arrests followed. JoAnn's damaged heart was no longer able to function properly. She would need a new heart, but until one became available, Mayo Clinic doctors bought JoAnn precious time by implanting a ventricular assist device (VAD) in her abdomen. The device works by strengthening the heart's own pumping action, and Mayo Clinic is a recognized expert in its use and follow-up care. Generally, the ventricular assist device serves as a temporary bridge to heart transplant. It allowed JoAnn to go home and resume her life as she waited for transplant surgery. 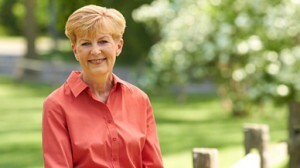 JoAnn credits the supportive environment of Mayo Clinic with helping her cope and remain optimistic during that wait. And when, months later, she underwent a successful heart transplant, her team continued to be there for her. "Everybody at Mayo has been very kind to me," she says, especially noting the "compassion and concern" of everyone she interacted with, including other patients. "Emotionally, you're changed after having something like this happen to you," says JoAnn. "You think differently about people and experiences." That includes a new appreciation of the generosity behind the decision to donate, whether it's an organ, bone marrow or stem cells. JoAnn works actively to get the message out about donation, to be part of the ripple effect that can touch so many lives. "The gift of life is priceless," she says. "I think of my donor every day."